Lyme disease is transmitted to humans through the bite of an infected Deer Tick. Deer ticks are blacklegged and have reddish brown bodies. They are only 1/8 of an inch long. Deer ticks are usually found in wooded areas. They will search for host animals from the leaf litter on the forest floor or from the tips of grasses and shrubs. Ticks will crawl onto animals or people; they cannot fly or jump. Mason County is now considered an established deer tick population county. However, the deer tick is very selective in its habitat, so do not assume that it is found throughout the county. The American dog tick and the lone-star tick are more common in Illinois. Symptoms associated with Lyme disease usually appear 3-14 days after a bite. Early symptoms include: bull’s eye rash, fatigue, chills and fever, headache, muscle joint pain, and swollen lymph nodes. Late symptoms include: Arthritis, numbness, pain, nerve paralysis, problems with memory and concentration, and sleep disturbances. Several antibiotics are used to treat Lyme disease. These can be taken by mouth or intravenously. When treated early patients usually recover rapidly and completely. Patients that have reoccurring symptoms are treated with further rounds of antibiotics. 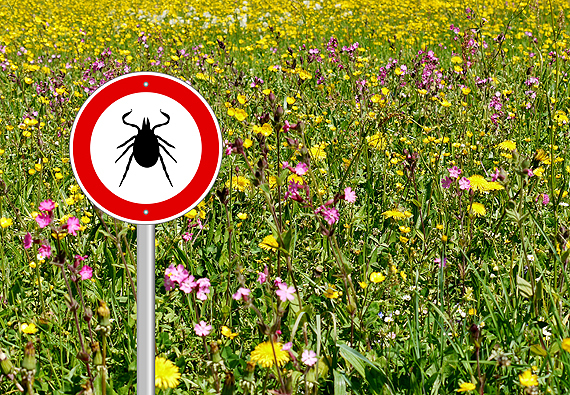 Lyme disease is rarely life threatening. There currently is no vaccination for Lyme disease. Remove the tick with tweezers. Try to avoid crushing the tick’s body as this will increase the likelihood of infection. Grasp the tick firmly and as close to the skin as possible. With a steady motion pull the tick away from the skin without twisting or jerking. Cleanse the area with antiseptic. In general a tick has to be attached 36-48 hours before it will transmit Lyme disease. Lyme disease is most diagnosed by the symptoms, so if you were bit by a suspected deer tick, keep aware of potential symptoms. DISCOURAGE ticks by clearing away debris and dense vegetation. Mow grass. DETACH tick immediately using the proper techniques.